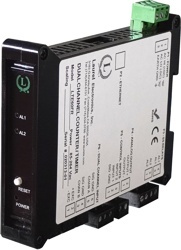 The Laureate 4-20 mA output, process signal input transmitter provides zero and span adjustment for use with a wide range of industrial transducers. Six DC voltage and four DC current input ranges are jumper selectable. The two most sensitive voltage ranges, 200.00 mV and 2.0000V, provide a high input impedance of 1 GΩ to minimize the load on the voltage signal. The transmitter can be set to a ratio mode (or potentiometer follower mode) by making selections at the connector and in software. In this mode, the transmitter output tracks a ratio of the applied excitation voltage and is unaffected by changes in the excitation voltage. This capability is used for resistive bridge sensors and voltage dividers, such as potentiometers which track wiper position. Ratiometric measurements provide an exceptional accuracy of 0.01% of reading ± 2 counts. Fast read rate at up to 50 or 60 conversions per second while integrating the signal over a full power line cycle is provided by Concurrent Slope (Pat 5,262,780) analog-to-digital conversion. High read rate is ideal for peak or valley capture and for real-time computer interface and control. Digital signal filtering modes are selectable for stable readings in electrically noisy environments. The internal digital readings and analog output can be individually selected to be either unfiltered or filtered. * Range not ETL certified. Reading Accuracy 0.01% of full scale ± 2 counts (except 5A range) for absolute measurements. 0.01% of reading ± 2 counts for ratiometric measurements. A Laureate process meter or transmitter with the Extended main board option allows exceptionally accurate custom curve linearization. For setup, up to 180 data points can be entered into a spreadsheet. The system then creates multiple non-linear spline-fit segments, which provide much better accuracy than linear segments. One application, as illustrated, is the readout of volume of irregularly shaped tanks based on measured liquid level or pressure. Altimeters and thermistors are further applications.